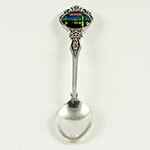 Silver-plated Massachusetts spoon with scalloped edge. Medallion reads Massachusetts 1788, The Bay State. Spoon measures 4 1/2 inches long.